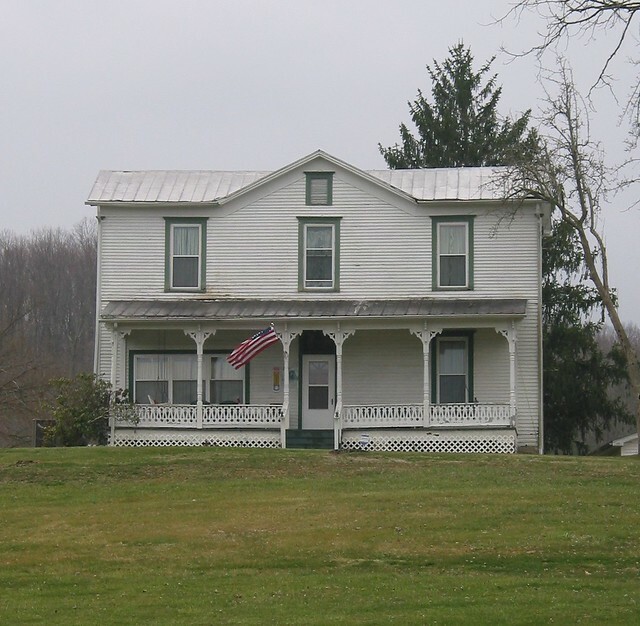 My grandparents lived in this West Virginia farmhouse when I was a kid. My mother painted this image of the house in 1972 when my Grandmother Hazel was contemplating moving to a newer home because this old house was too much for her to manage on her own. In the painting, the curtain is pulled back in the 2nd floor center window. My Grandmother pulled the curtain aside when she was sewing, so she would have been sewing on the day the photo was taken that my Mother referenced for the painting. So, although you can’t see her, she is there at the sewing machine on the other side of the window. It had been many years since I had seen the old house and I was almost certain that it would have been replaced by a sub-division or a pharmacy. But I took a drive by it after an Easter visit with my family in West Virginia last weekend. I was delighted to see it was still there even though the area has seen a lot of new development. Many of the trees have disappeared in the last 40 years, but the new owners have kept it almost exactly the same and it really looks great. 03 Apr	This entry was published on April 3, 2013 at 2:23 pm. It’s filed under Family History and tagged Architecture, Farm house, Painting, Patty Reed. Bookmark the permalink. Follow any comments here with the RSS feed for this post. Newer: Haverford Guild Spring Craft Show May 3 & 4, 2013! !